The floodgates of Rise of Iron info remain open at Game Informer, which released a podcast yesterday discussing their time with the upcoming expansion and a new article today showcasing the Exotic Khvostov 7G-0X Auto/Pulse/Scout Rifle. The podcast reiterated some things, but also contained new details about their hands-on experience. Some of the new information focused on the experience of exploring the Plaguelands, including descriptions of the landscape growing more industrial and SIVA-influenced the farther you venture, ultimately culminating in a huge Fallen Fortress that houses the Archon’s Forge player-initiated public event. In addition, they revealed that mixed in among the usual loot chests in the Plaguelands are “poison” or “mimic” chests, which cause something “bad” to happen. New collectible items are also scattered throughout the new patrol zone, including more Dead Ghosts and a SIVA-themed collectible along the lines of Calcified Fragments. As we explore, it seems we’ll also be able to see both Strike and Raid areas in the patrol zones, as both the new Strike and the Wrath of the Machine raid take place in the Plaguelands. It’s unclear if passing Guardians will be able to help Strike or Raid fireteams in any way, as they can with the entrance to the Vault of Glass, but that would certainly make things very interesting. 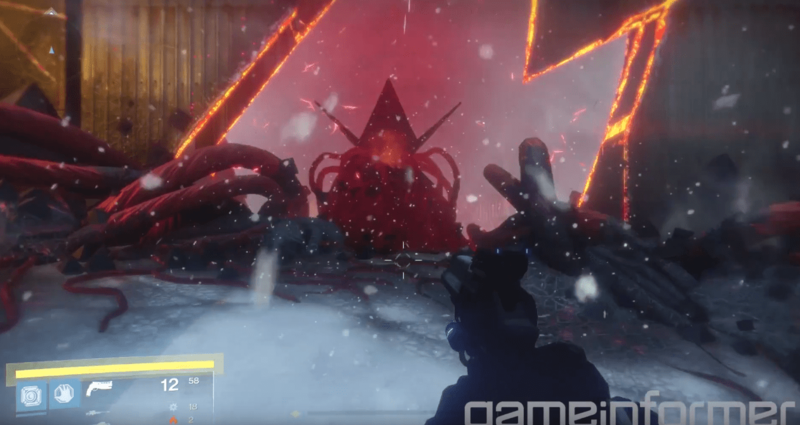 Speaking of Strikes, they also confirmed that the revamped Devils Lair (Sepiks Perfected) and Summoning Pits (Abomination Heist) strikes involve a lot of SIVA. Sepiks himself gets a new SIVA version, but its unclear if the Hive Abomination waiting on the moon is SIVA-infected or not. Both strikes have also received graphical and audio overhauls including new scripts and voice-acting which is exciting to hear. We already know that the tone of Rise of Iron will be focused in many ways on nostalgia, times past, and our own rise to become the heroes of the new Guardian age, but it sounds like the cutscenes featuring Lord Saladin and others will take on a more somber and serious tone, much different from the Taken King’s heavy focus on Cayde-6. On the lighter side, Game Informer indicates that the Ghost has more personality than ever, which should be a treat. Beyond that, Game Informer also announced an upcoming video will feature an interview the team behind Destiny’s newest raid, in which they will discuss their philosophies and design practices but carefully avoid any spoilers. That said, the Death Zamboni featured in the original Rise of Iron trailer seems to have been confirmed as a Raid encounter, so we have that to look forward to. Their next Destiny news update is scheduled for Monday, August 8th, so the video will most likely release then. Game Informer released a video showing off some gameplay with the updated Khvostov! The gun can be easily tailored to your playstyle, and obtainable via a quest that is triggered when you discover a Khvostov Weapon Part, which can drop randomly from a variety of activities. If you still own the original, dismantling it will be the quickest way to guarantee the necessary weapon part. Hope you held onto yours! Khvostov’s ornaments will unlock once players find the requisite items to activate them. Players will also be freely able to switch between these ornaments after they’ve been unlocked. They’re only cosmetic changes that won’t affect performance. Finally, Activision CEO Eric Hirshberg said in an investor conference call that Destiny 2 will release in 2017, probably in the second half of the year, and that the majority of the team at Bungie is focused on that project. Good things to come!